Between work, play, and visiting family, I’ve spent a lot of time in airports this summer. Occasionally I’ve browsed in the many shops designed to help us survive hours of layovers. In one of those browsing moments I came across a slim volume titled Before They Were Our Mothers: Voices of Women Born Before Rosie Started Riveting. The book was conceived when author Patricia Nugent realized, at her mother’s funeral, how little she knew about her mother’s life before Patricia’s birth. Who was her mother, before she was a mother? To inspire others to share their personal stories, she collected brief real-life accounts of women before marriage from the 1880s to the 1940s. It was intended particularly for daughters and granddaughters, to prompt them to learn about their foremothers while those essential women are still alive. But Before They Were Our Mothers could have a place in schools, too. 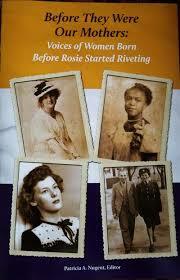 The book includes stories of ordinary people dealing with racism, war, poverty, and struggles of all kinds. In the forward, the author describes the accounts as “ordinary lives infused with determination and defiance, resilience, and resistance.” They could become models for writing creative non-fiction, or inspiration for learning interview techniques for historical research. I still remember my seventh grade history assignment that asked us to interview a grandparent or older friend/relative who lived through the Great Depression. That assignment brought those years to life. This book might inspire a similar assignment for your students. Or maybe Before They Were Our Mothers will inspire you to talk to your own mother, father, or other relatives about who they were before you came into the picture. I’m pretty sure author Nugent would be thrilled—and I suspect you’d need to exercise some flexible thinking to envision those young people, not so very long ago. « I’m Not Creative. . . .